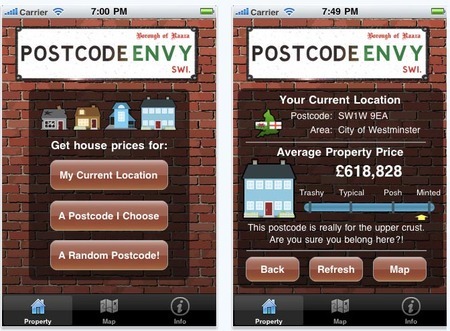 Postcode Envy panders to two great British obsessions – class and house prices – so I bet that this little app will sell well. Postcode Envy doesn’t do much – just tells you the average house price in a given postcode area, puts your neighbourhood on a scale from Trashy to Minted and then gives you some cheeky little comment like “if you know someone who lives here, please help them escape”. It covers only England and Wales, but does seem to update its information regularly which is good. Thing is, once you’ve searched for yourself, your mum and your friends – then there’s not much reason to use it again… though the Random Postcode button is quite an interesting way to explore the UK. Still I think this will sell – did I mention it’s about House Prices?